The Tokyo-based Penta-Ocean Construction Co. has taken delivery of Japan’s first offshore wind turbine installation vessel, which is now ready for first work. Penta-Ocean Construction, who ordered the CP-8001 vessel from Japan Marine United Corporation (JMU) in 2016, held the completion ceremony last week. According to the vessel designer GustoMSC, the delivery marks an important milestone for the Japanese offshore wind development as this is the first and largest DP2 jack-up built in Japan for offshore wind and civil construction projects. The vessel was completed earlier this year, after which it conducted various sea and jacking trials in the country’s coastal waters. “The CP-8001’s unique features allow highly efficient operations in Japanese ocean side areas with harsh wave and weather conditions, while not giving in on the welfare of the crew,” said Jan-Mark Meeuwisse, Commercial Director at GustoMSC. “The proven technology make it most suitable for various installation works from a safe and stable self-elevating platform. The enactment of relevant Japanese regulations will undoubtedly provide further potential for offshore wind farm projects. 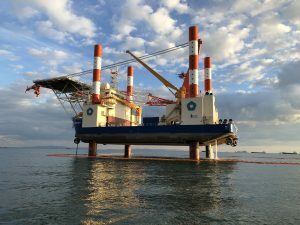 The GustoMSC GJ-3750C designed vessel is able to install large-scale marine structures such as 10MW turbines in water depths up to 30m with leg length of 66.7m, while the unit is designed for 86m legs in 50m water depth. CP-8001 offers living quarters for a maximum of 120 people and office and recreational rooms, as well as a heli-deck for crew changes and emergency response. The vessel certifies Class NK DPS-B, a dynamic position system (DP2), and with four thrusters remains in a precise position even in severe conditions, the Dutch designer said.